Fun New Game: What, Exactly, IS On Adele's Nails? We love our lady Adele — for her powerhouse voice, her beauty, and maybe the most for her devil-may-care attitude. Whether she's rocking natural makeup or fully decked out in her now-famous retro garb, the diva always looks incredible — and, of course, she totally brought it at Buckingham palace while receiving the prestigious MBE medal from Prince Charles. We could spend all day talking about the 25-year-old's perfect beehive and epic cage veil, but we'd say that the best part of her look, bar none, is her decked-out manicure. Adele has debuted rockin' nail looks in the past (her Louboutin-esque red nails blew our minds at last year's Grammys), but these navy-blue talons take the cake. If you look closely, she's even wearing nail jewelry on her ring fingers...we just can't figure out what, exactly, they are. The beauty department's current theories: Tiny houses? Crowns? Christmas ornaments? A wee MBE? We're not sure, but we love that our cheeky lady rocked such an unconventional mani at the Palace. 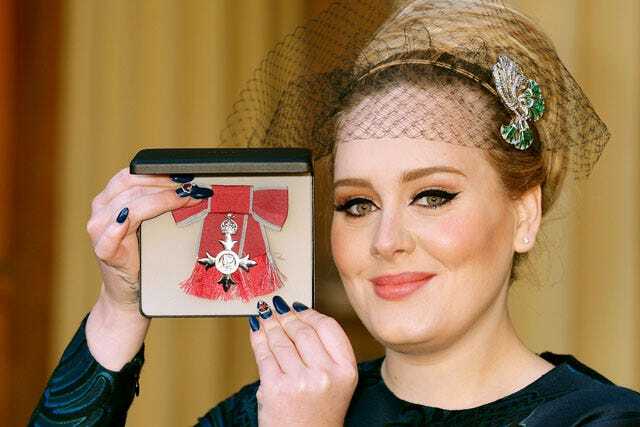 Adele is our ultimate proper-but-not Englishwoman — we're just hoping that she reveals what is going on with those nails. Hey, readers: Any ideas of your own?